C-Section Delivery: When Is a C-Section Delivery Safer Than a Vaginal Birth? A cesarean (C-section) delivery is usually recommended if a vaginal delivery would put the baby or mother’s life or health at risk. A C-section is an operative procedure whereby the physician makes one or more incisions through a mother’s abdomen and uterus (womb) in order to deliver a baby or babies. Two of the most important actions physicians can take to prevent birth injuries are 1.) recognizing fetal distress or a condition that can cause distress, and 2.) performing a quick C-section delivery when distress or impending distress is evident. Sometimes C-sections are planned, and sometimes they take place during emergency situations when the baby is oxygen deprived and in distress, or certain conditions are present that make it impossible or difficult for the baby to navigate the birth canal safely. When certain conditions are present, such as shoulder dystocia (baby’s shoulder is stuck on the mother’s pelvis), certain breech or face presentations, cephalopelvic disproportion (CPD), macrosomia or placenta previa, attempting a vaginal delivery can cause serious trauma to the baby, as well as oxygen deprivation and fetal distress caused by a prolonged labor. In addition to the aforementioned conditions, there are numerous other complications that can occur during or near the time of delivery that can cause the baby to suffer from a lack of oxygen to her brain and distress. Oxygen deprivation (fetal distress) will manifest on the fetal heart rate monitor as a non-reassuring heart tracing. The baby must be delivered by a prompt C-section when this occurs, in most cases. Listed below are instances in which it is safer to deliver a baby by C-section delivery. Who Can Opt for a C-Section? Intracranial hemorrhages (brain bleeds), which can be caused by a traumatic delivery. Forceps and vacuum extractors can cause brain bleeds. Labor induction drugs: Sometimes intense contractions (hyperstimulation) caused by labor induction drugs (Pitocin and Cytotec) can cause head trauma. Fetal size and presentation abnormalities: Mismanagement of cephalopelvic disproportion (CPD), abnormal presentations (face or breech presentation), and shoulder dystocia also put a child at risk of having a brain bleed. Stalled Labor: Prolonged and arrested (stalled) labor are some of the most common reasons for a C-section delivery. Labor is traumatic for the baby, and the longer it continues, the more risk there is that the baby will experience oxygen deprivation, especially if the placenta isn’t able to continuously supply the baby with oxygen-rich blood. Multiple Gestation Pregnancy: When a women is pregnant with twins, triplets or other multiples, it places the babies at risk for a number of conditions, including umbilical cord compression. 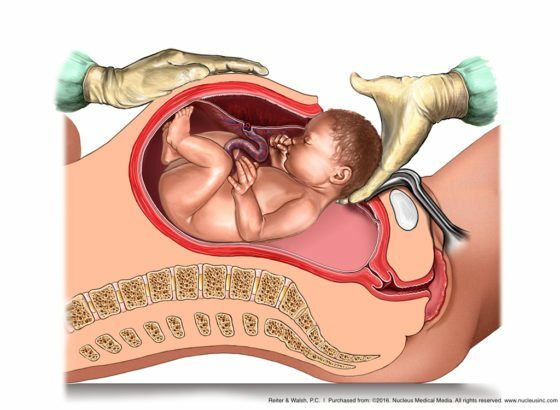 Abnormal Fetal Position or Presentation: A C-section is the safest method of delivery if the baby’s feet or buttocks enter the birth canal first (breech presentation); if the baby is positioned with her side or shoulder first (transverse); and if the baby is presenting face first, with her chin facing the mother’s back, pointing down towards the mother’s buttocks (baby’s head, neck and shoulders enter the pelvis at the same time). Uterine or Placental Complications: If the placenta detaches from the uterus (womb) before labor begins (placental abruption), or the placenta covers the opening of the cervix (placenta previa) a C-section is required. A vaginal delivery is impossible if placenta previa is present at the time of delivery, and attempting vaginal delivery when a placental abruption and fetal distress are present can worsen the distress. Placenta accrete is when the placenta is deeply attached to the middle part of the uterine wall, and this required a C-section delivery to avoid major hemorrhaging. Uterine Rupture: A ruptured uterus is when there is a complete tear of all uterine layers. When this occurs, the baby could spill out of the womb and into the mother’s abdomen. Severe hemorrhaging in the mother is common, and this can cause a major decrease in the amount of oxygen-rich blood being delivered to the baby. If the uterine tear causes the placenta to be torn away from the uterus, the baby will be totally cut off from her supply of oxygen. Umbilical Cord Complications: A C-section is often recommended if part of the umbilical cord slips through the cervix ahead of the baby (cord prolapse) or if the cord is compressed by the uterus during contractions. In addition, an abnormally short umbilical cord can get stretched and torn during vaginal delivery, and a major complication of a short cord is placental abruption. Any movement of the baby can pull on the cord’s insertion point on the placenta, causing the placenta to pull away, leading to severe bleeding. When the cord is in a true knot, the knot can tighten during vaginal delivery, causing compression of the cord vessels, which decreases the amount of oxygen-rich blood going to the baby. Maternal Health Problems: Expectant mothers may have health conditions that can make labor dangerous, such as unstable heart disease or high blood pressure. Preeclampsia (high blood pressure during pregnancy) can turn to eclampsia during labor, which is a condition characterized by a major seizure or seizures in the mother. This can cause severe fetal compromise and even death of the baby. Vasa Previa: This is when the fetal blood vessels are crossing or running close to the inner opening of the womb (cervical os). The vessels are at risk of rupturing when the supporting membranes rupture, and an emergency C-section delivery is required when this condition is present. Maternal Infections: Maternal infections, such as herpes simplex virus or HIV, can have the potential to spread to the baby during vaginal birth. These conditions also require a C-section delivery. Indeed, it is the standard of care to continuously monitor the baby’s heart rate when the mother is admitted to the labor and delivery unit. Sometimes, the medical team monitoring the mother and baby are not properly trained in interpreting the fetal heart rate tracings. Other times, there is a breakdown in communication and the physician is not contacted quickly enough or the physician does not respond fast enough to communications regarding a baby’s distress. When a baby is in distress, it means she is suffering from a lack of oxygen in her brain, and this can cause permanent brain injury if prolonged. Getting the baby out of the womb is the only way to directly help her and give her oxygen and other critical treatments, such as resuscitation maneuvers. It is against the standard of care for a hospital to hold itself out as a labor and delivery unit and then fail to have the capacity to quickly perform an emergency C-section. It is very troubling to see cases whereby distress was evident on the fetal monitor and the staff acted with no sense of urgency in getting the baby delivered by C-section. In so many cases, there are obvious signs of distress on the monitor with nobody recognizing it, or when the signs are recognized, the staff performs time consuming tests, leaving the baby in oxygen depriving conditions for too long. Most babies are born healthy and do not require emergency plans of action during delivery. But this does not mean the hospital can cut corners and take chances by being short staffed or not having proper C-section equipment in the labor and delivery unit. Watching the fetal heart monitor for signs of distress and delivering a baby by emergency C-section are relatively simple procedures that can prevent a baby from being oxygen deprived and developing injuries that can cause the child to have lifelong, debilitating problems such as cerebral palsy, hypoxic ischemic encephalopathy (HIE), seizures, intellectual disabilities, and Erb’s palsy. Simple mistakes, such as failure to recognize and act on fetal distress, can cause an otherwise healthy child to have severe and permanent problems. An area of negligence we commonly see is when fetal distress is promptly recognized but the physician continuously attempts vaginal delivery instead of moving on to a C-section delivery. Prolonged labor and delivery is associated with oxygen deprivation in the baby. Often, when physicians know that a baby must be quickly delivered, they administer Pitocin or Cytotec to try and speed up delivery. These drugs are very risky; they can cause contractions to be so fast and strong that the baby becomes deprived (or further deprived) of oxygen. Even riskier are dangerous delivery devices, such as forceps and vacuum extractors. Instead of moving on to a C-section, physicians sometimes think it will be faster to try and deliver a baby with these instruments, which can cause brain trauma and brain bleeds. Not only are Pitocin, Cytotec, forceps and vacuum extractors dangerous, but using these may prolong the delivery even more, worsening the oxygen deprivation and fetal distress. C-sections are very common and the process is straightforward. Use of delivery drugs and instruments, on the other hand, is unpredictable and risky. Physicians can’t predict how Pitocin and Cytotec will affect the mother and unborn baby. Forceps and vacuum extractors attach directly to the baby’s head and can cause severe trauma, especially when the physician is unskilled. Sometimes physicians are unaware that certain problems are present, such as shoulder dystocia (baby’s shoulder stuck on mother’s pelvis), cephalopelvic disproportion (CPD) or umbilical cord problems, and use of a delivery instrument may be contraindicated or extremely risky, causing major injury to the baby. The consensus among many experts is that once the decision to perform a C-section is made, the baby should be delivered within 30 minutes of the decision. However, in ominous circumstances, such as a complete placental abruption or total umbilical cord compression, an emergency C-section should be performed as quickly as possible, usually within 10 – 18 minutes or less. Reiter & Walsh ABC Law Centers is a national birth injury law firm that has been advocating for children for decades. 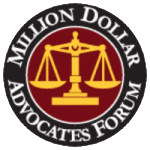 The attorneys at ABC Law Centers have won numerous awards for their advocacy of children and are members of the Birth Trauma Litigation Group (BTLG) and the Michigan Association for Justice (MAJ). When you need the help of a birth injury lawyer, it is very important to choose a lawyer and firm that focus solely on birth injury cases. 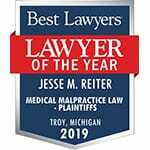 Birth injury lawyer Jesse Reiter, president of the firm, has been focusing solely on birth injury cases for over 28 years, and most of his cases involve hypoxic ischemic encephalopathy (HIE) and cerebral palsy. 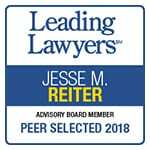 Jesse is currently recognized as one of the best medical malpractice lawyers in America by U.S. News and World Report 2014, which also recognized ABC Law Centers as one of the best medical malpractice law firms in the nation.